FundInvoice offer the UK's 1st research based, independent advice and search service for business finance such as invoice finance, factoring, invoice discounting, trade finance and business loans. We encourage our customers to review the service that they receive from us and we post those ratings and reviews here without alteration or ommission. With 5 stars being the highest rating that can be ascribed. It will be posted unaltered (only client names and finance company names are not shown) to preserve confidentiality. We are delighted to confirm that overall, our customers have given us an average rating of: 4.9 out of 5 (25 ratings given). A pleasure doing business with, Sean is extremely attentive, but more importantly gets results and is very accurate. I simply wont use any other broker. 5/5 Last year when we were looking to change an existing factoring facility, Sean was able to come up with an excellent alternative. He made sure he understood our business needs and was guiding and reassuring during the transition process. We’ve been using the recommended facility for a year now and very happy with all aspects from service to fees. We can recommend Sean and his team to anyone who is looking for invoice finance for their business. (Read more about the testimonial from this Care Home Recruiter). 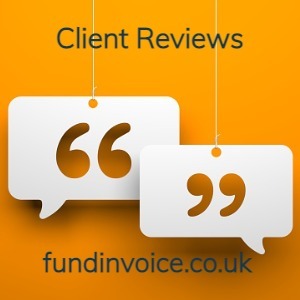 5/5 I would have no hesitation recommending FundInvoice to any business owner considering their Invoice & Asset Finance needs. Sean Morrow took time and interest to fully understand our business needs and to help us make the correct decisions for our business. 5/5 Sean was very helpful when we were looking to move our factoring arrangement, talking us through options and offering a range of solutions including one that suited us well. 5/5 It’s a 5 from me naturally mate! Even if [PROVIDER] couldn’t of helped it was just the fact that you listened! definitely be recommending Sean to anyone who needs help with any Business Finance Solution. professional and friendly service. For anyone looking for invoice financing options I would recommend FundInvoice to anyone as a first point of call. 5/5 Sean offers a very personally service and helped us find the best option for us. Highly recommended. ensured we got the best deal available. with the recommendation given and will highly recommend Sean and FundInvoice LLP. 5/5 We used Sean Morrow of FundInvoice LLP to try and find us a better Invoice Financing deal than the one we were currently receiving through our bank. Sean did an excellent job introducing us to a number of different contacts who could offer us better deals than what we were getting. In the end our bank offered us a much better deal as they did not want to loose our custom. I would rate Sean 5 out of 5.
exactly what I need and at the right price, I wouldn’t hesitate to recommend him. a week of me making the first enquiry Would not hesitate to recommend to any business. for your help in getting the [INVOICE FINANCE COMPANY] facility off the ground, much appreciated. RATING – 5! recommend and company, start up or established, to speak to Sean who I'm sure will provide excellent customer service and know how. Once again,thank you for all your help. 5/5 Sean provided much needed assistance in seeking a factorng or invoice discounting facility for my company. His supportive, professional and persistent approach helped us at a time when we really needed it. I would recommend Sean without hesitation. suitable that not only what we were experiencing before, but also exceeding our expectations. We would highly recommend FundInvoice to anyone looking for the right help and advice in choosing a factor that best suits their needs. 5 out of 5 for their service!!!!! Note: where ratings are "NR", feedback was a comment only and a star rating was not given.